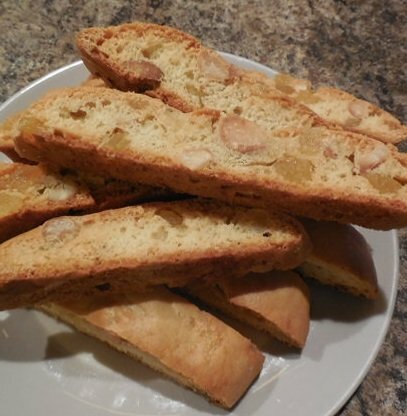 If you follow these Biscotti Baking Tips, you will find that making biscotti at home is not that difficult and the results will be be very rewarding. The equipment required is minimal, a bowl and heavy spoon, electric mixer and a baking sheet are the only requirements. Of course if you have a stand mixer you can use that. It takes about 15 minutes to mix the dough and shape it into baking logs. After the first baking, a few minutes cooling, cutting the cookie on a diagonal, you return them to the pan for the second baking. When done you are rewarded with a tin full of one of the most amazing treats, that will last for weeks (if hidden from those with a passion for eating them). One of the most important Biscotti Baking Tips, true for any baking, is Measure Ingredients Accurately! Use dry measuring cups for the dry ingredients like flour and sugar and liquid measuring cups with spouts -- made of clear glass or plastic for ingredients like water, milk, and honey. Flour: Give it a stir to fluff it up and then dip the cup into the flour or spoon flour into the cup and level with a knife. Granulated or Powdered Sugar: Can be scooped or spooned into the cup and then leveled with the edge of a knife or spatula. If the powdered sugar is lumpy, it is best to sift it first. Brown Sugar: Should be packed or pressed into the measuring cup. Liquids: Pour them into a glass or clear plastic spouted measuring cup that is placed on a level surface and bend down to eye level to make sure you have the correct amount. Sticky Ingredients Like Honey or Molasses: Use your glass measuring cup to measure your oil first, then measure your honey or molasses, and it will slip right out. Alternatively you can give your measuring cup a little shot of cooking spray before filling it with the sticky substance. Allow ingredients to come to room temperature before beginning. If you need to bring eggs to room temperature quickly, place them in warm water for several seconds. Butter can be softened in the microwave with short 10 second burst on low power. Be careful not to let your butter start to melt. Mix and knead dough just until it comes together, don’t overdo it. If the dough becomes difficult to handle, simply refrigerate for at least an hour, before kneading and shaping. If using a stand mixer like a Kitchen Aid, take care to not over mix the dough, warming it, making it difficult to handle and tough after baking. Tips for using your KitchenAid. Combine the dry ingredients with a whisk to ensure everything is evenly and well distributed. If you have a stand mixer,check out our review of a Biscotti Cookbook Review of a book where almost all the recipes are made using a stand mixer. Handling and shaping the dough is one of the more difficult parts of this cookie so follow these biscotti baking tips for handling and shaping. Dust your work surface and your hands with flour before beginning to try to form the dough into logs. It will be a sticky, messy job, but one that is well worth it. Add small amounts of more flour as necessary until you have shaped them into the size log/slab specified in your recipe. If the dough contains melted chocolate or other ingredients that make it sticky and hard to handle, simply refrigerate for at least an hour so it hardens more before kneading and shaping. If the dough is extremely sticky like the Valentines Day Biscotti, keeping your hands damp will help keep them from sticking while shaping the dough. One other method is to spray your hands with and aerosol can of vegetable spray like Pam. If you are busy and who isn’t then you can bake it in stages. Make the dough and store it in the refrigerator for a day or two. Form the dough into logs and bake them, store the slabs at room temperature for up to a day. Slice them and baking them the second time. Here are some more biscotti baking tips you will find helpful. Verify oven temperature with a thermometer placed inside your oven before baking your biscotti. Once your oven is pre-heated adjust the oven setting as necessary to get the desired inside temperature. If you do a lot of baking or if the oven temperature is off my more than 50 degrees it may be best to get your oven calibrated by a repairman or technician. Though not necessary, lining your pan with parchment paper will make the baked log easier to remove and pan clean up a snap. When greasing pans, the most expedient solution is to use cooking spray. Or you can grease with butter and shortening and a pastry brush. Another great option is to line your pans with a silicon baking sheet. Always begin with a cool baking sheet. If it is hot from the oven, your biscotti dough will melt and spread before it has a chance to bake. Use sturdy baking sheets, either rimmed or not. Many books suggest baking cookies on rimless pans, but I have always had good success with rimmed pans. When baking more than one cookie sheet at a time rotate the sheets (front to back and top to bottom) about halfway through the recommended baking time. Bake your biscotti in the middle of the oven for best results. If baked on the bottom, they are apt to burn. For a glossier looking biscotti, brush with a mixture of one egg yolk and table spoon water or milk whisked. Depending on the humidity the second baking may take longer. You are looking to get your biscotti dried out and crunchy. Don't skip the crunch! 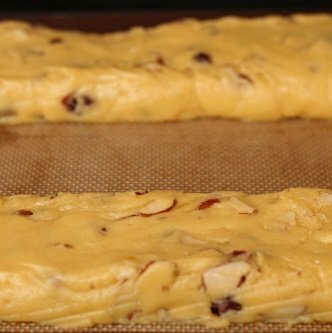 If you are in a hurry, especially if baking a lot of biscotti put a marble slab in the fridge and transfer the log to the slab to speed cooling. When it comes to cutting biscotti, follow these Biscotti Baking Tips and you will become a master at cutting and creating beautiful looking biscuits. Use a serrated knife for cutting or try your electric knife if you have one. Be sure to cut straight up and down, perpendicular to the pan; if you cut unevenly, biscotti may be thicker at the top than the bottom, and they’ll topple over during their second bake. The biscotti log or cookie may crumble while trying to cut it. If it does, wrap the baked dough and freeze overnight. The next day, a serrated knife will produce thin slices. This technique is especially useful when the biscotti contain whole nuts. Another option to prevent crumbling; using a spray bottle filled with room-temperature water, lightly but thoroughly spritz the log, making sure to cover the sides as well as the top. Wait 5 minutes before slicing. Softening the crust just this little bit will make slicing the biscotti much easier. Some of the recipes have alternative ingredients so open your baking cupboard and see what creative flavor variations you come up with. 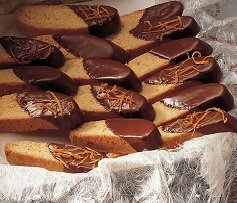 For extra long biscotti, make one large log (most recipe call for making two logs) so the cookies can be 7 to 10 inches in length for that "gourmet" look. If they should lose their crispness, simply toast them in a low oven (250 degrees) for a few minutes until they’re crunchy again. If they’re too hard or dry, place them on low power setting in the microwave for about 30 seconds to soften them up. For longer storage (up to 3 months), place the air tight container in the freezer. Okay, you've reviewed Biscotti Baking Tips and have some ideas for making, baking and perfecting your biscotti. Now it's time to get baking. 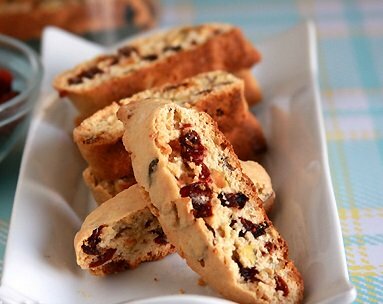 I hope that you have as much fun making and sharing your biscotti as I do! Do you have a great baking tip or a question about baking? Our readers would love to here your Tip or if you have a Question help you find an answer. Your Tip or Question will appear on a Web page exactly the way you enter it here, or if necessary with minor editing.